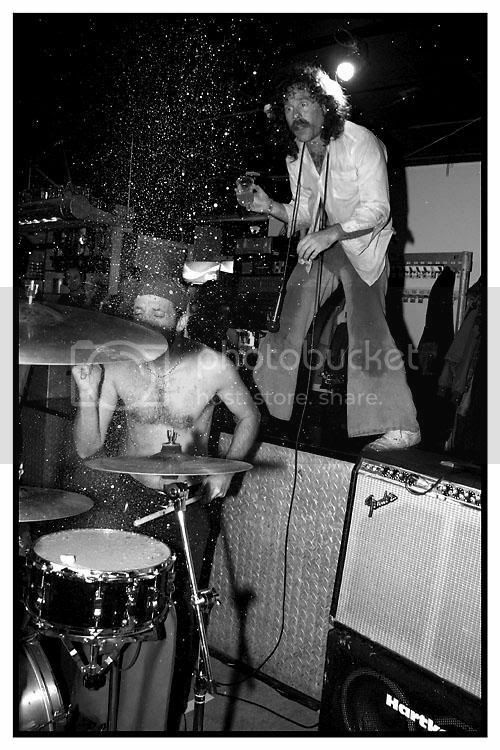 Monotonix are a punk trio from Tel Aviv, featuring guitar (Yonatan), drums (Ran) and vocals (Ami). They formed in November 2005, set up on the floor of the club with the audience, and the party began. But the party usually got too wild, the power got cut, the cops were called and Monotonix were banned from playing again almost everywhere. Before long, they were looking for good places to play outside of Israel and they were delighted to find that there were more rock and roll party places outside of Israel than inside! "You can't possibly put on paper how much energy this band has live. Ami Shalev, the band's singer was, at his highest point, hanging from a steel rafter roughly twenty feet above my head... and at his lowest had his head burried into a knocked over fifty galon trash bin, still singing. They're a straight-forward, crunchy, loud, rock band. Don't let that fool you though... this band is incredibly powerful. You cannot possibly fully appreciate them until you see it live. To be honest, it was the best show I've seen in a long time." "This was performance as performance art and rock as confrontation. No matter where you stood in the sharp divide (I bought a T-shirt if you're wondering), you wouldn't soon forget seeing Monotonix live." "When the lead singer burst on to stage, we weren't really sure it was the lead singer. It could've been some fan. Or, I don't know, a vagrant. Within 30 seconds he had lept the security fence and into the audience, where he spent most of the performance. I don't think I've spent that much time looking behind me at a show. he turned the crowd entranced. The end of the show brought it all together. They pulled down the drums, the guitar, and everything came into the audience. we all played till the end." some straight outta SXSW 2008 Monotonix clips!!! Hopefully I will be here, sounds more up my street than moorins gig, but hopefull I will make it down there at some point. What time will this be wrapped up(approx)? 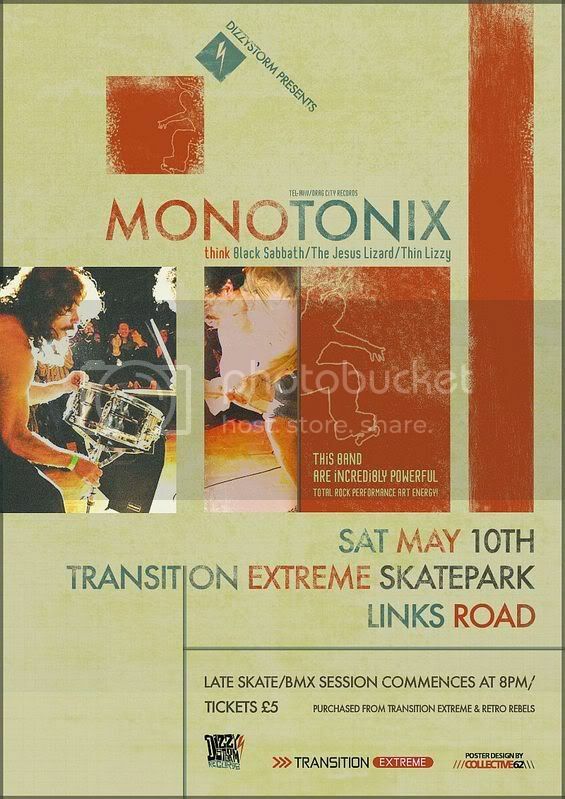 i wouldnt think there'll be anything happening music wise till after 9pm, got to set up after the bmx jam finishes at 7ish..
After watching Monotonix last night. Everybody should got to this gig. The amount of abuse the drummer took from the singer was unreal. My tired body will be along to this! It was afa good, the sound was surprisingly excellent from all angles, they played in the middle of the skate park with a very decent PA, and weird angles of skate ramps all around, the skaters and BMXers went whizzing past at alarming rates and were occasionally frightening, but in comparison to Monotonix they were pretty namby pamby... the singer poured bottles of water over the snare drum which exploded spectacularly on the hard hits ,the kick drum was re -positioned mid gig and played by the guitarist whilst the drummer conjured eclectic beats out of the hi hat and snare drum and they were acrobatically excellent with the singer performing as if Iggy Pop was his mere grandfather, balancing atop the drummers shoulders, mid performance was a hoot, he he, a great speactacle .